The cost of developing a new drug from conception in the laboratory, through in vitro and in vivo studies and then through required clinical trials to final approval by the United States Food and Drug Administration or its European equivalent, for wide clinical use is in excess of several hundred million dollars. With a changing health care environment, stiff market place competition and high infrastructure costs involved in pharmaceutical research, development and marketing, drug development represents an enormous investment of money and resources. Matching this, the process of drug development within the pharmaceutical industry is changing to favor a “high tech”, efficient and, primarily, ex vivo approach by using molecular biology to characterize and often patent new, hopefully critical and ratelimiting subcellular targets and high throughput combinatorial chemistry to generate libraries of multiple thousands of compounds for screening. With such financial investment, a focus has been towards the rapid development of billion dollar drugs in large patient populations. There have been successful examples of this development system. 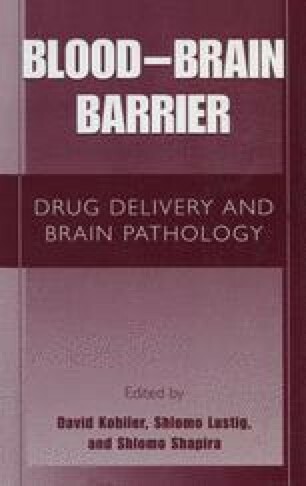 However, these must be counterbalanced by the knowledge that (i) when the wrong avenue is chosen in the development scheme it can be hugely costly, and the presence of the blood-brain barrier (BBB) certainly complicates the choice of avenues, and (ii) it is unlikely that new therapeutics will be specifically designed and developed for numerous crippling and fatal diseases in smaller patient populations, which includes many neurological diseases. Certainly, some new therapeutics will prove beneficial for use in diseases other than the ones for which they were specifically designed and developed, but when this occurs it can be considered fortuitous rather than planned. Despite this, it is clear that better use of the drugs that we already have available is required if treatment advances are to be made.